With PIRATES OF THE CARIBBEAN: AT WORLD’S END in 2007, it was thought that the franchise had done its “trilogical” duty. True. The film itself was a convoluted mess, but it delivered one of the most exhilarating film score experiences of the year and so, in that sense, the trilogy was concluding on a high note. Well, actually there was one other note on which the film proved successful. Let’s call it nearly 1 billion, worldwide notes. With all those notes in mind, when it was announced that Captain Jack would be back, it probably should have come as little surprise. But where would the franchise go from the end of the world? 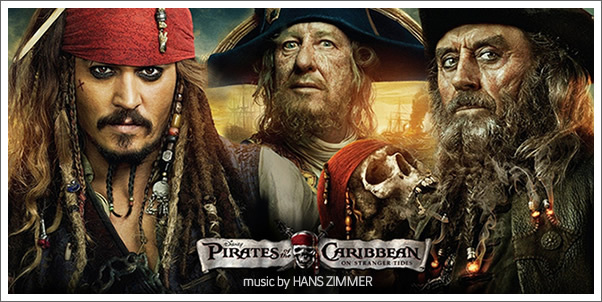 Four years later, PIRATES OF THE CARIBBEAN: ON STRANGER TIDES would see the return of Jack Sparrow as well as composer Hans Zimmer. However, director Gore Verbinski would not be returning as the romantic tale of William Turner and Elizabeth Swann had come to an end. Instead, Captain Sparrow would now be the centerpiece of the story and this time director Rob Marshall would be calling the shots. The final result is a film that is more straight-forward than its predecessors, but in fact too much so. This fourth foray into this famous world of Disney lacked much of the grandeur, attention to detail, and fun of the first three. A race for the mystical fountain of youth with the likes of Sparrow, Barbosa, and the infamous Blackbeard would seem to provide a big enough splash easily increased, by a decent original score, into a tidal wave of a film. As it turns out, On Stranger Tides, is further evidence that the tide has been slowly receding since the closing credits of the CURSE OF THE BLACK PEARL. HANS ZIMMER returns to high seas hijinks, but this time his shipmates are the amazingly talented guitar-duo of RODRIGO Y GABRIELA. To reflect the inclusion of a Spanish armada and Sparrow’s love interest, Angelica Teach, incorporating the duo was a brilliant call. Most unfortunately, their creative contributions largely go to waste...especially as heard in the film. The soundtrack release itself does offer a better sampling of their work, but, as we’ll look at later, suffers from its own mixups and setbacks.